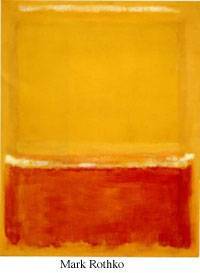 Of ten credited as the first uniquely American style, Abstract Expressionism is a movement that developed in American painting during the 1940s and 1950s, and at that time generally referred to all types of non-geometric abstraction. 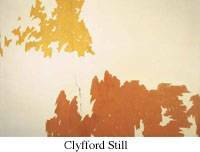 It was the first American visual art to gain international status and influence. 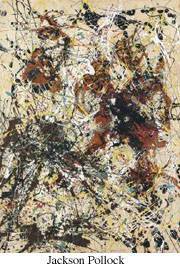 The term, commonly associated with post-war American art, was first used in 1946 by an American critic, in referring to the work of Arshile Gorky (1904-1948), Jackson Pollock (1912-1956) and Willem de Kooning (1904-1997). Abstract Expressionism does not describe a style as much as it does an attitude. Its roots are in European Neo-Expressionism, which came across the ocean with expatriate avant-garde artists such as Marcel Duchamp (1887-1968) who fled Nazi Germany for New York City and Hans Hofmann (1880-1966), who became a chief exponent as painter and teacher in America of Abstract Expressionism. Many post-war American artists felt weary of European-linked art such as Impressionism and Classicism, and sought new directions. Typically these new artists applied paint rapidly in an effort to show feelings and emotion. Not all of their art was abstract or expressive, but they felt that through spontaneity they would release the creativity of their subconscious minds. Abstract Expressionist artists were influenced by Existentialist ideas, which emphasized the importance of the act of creating, not of the finished object. T here are two distinct groups within the movement: Color Field artists, such as Mark Rothko (1903-1970), Barnett Newman (1905-1970), Clyfford Still (1904-1980), and Kenneth Noland (1924-2010), who worked with simple unified blocks of color and explored the effect of pure color on a canvas; and Gestural or ‘Action’ Painting artists, including Pollock, de Kooning, Hofmann, Franz Kline (1910-1962), Philip Guston (1913-1980), where the focus was on the physical action involved in painting. Pollock, nicknamed ‘Jack the Dripper’, is perhaps the most sensational and famous of the action painters because of his canvases of poured paint, which he applied with arm-swinging gestures. W hile post-World War II painters, including Pollock, DeKooning, and Robert Motherwell (1915-1991) shared the spotlight, the era's sculptors received only modest critical and popular acclaim. However, sculptors such as Seymour Lipton (1903-1986), Theodore Roszak (1907-1981), Herbert Ferber (1906-1991), David Smith (1906-1965), and Isamu Noguchi (1904-1988) shared the intellectual roots and experiential culture of war that characterized the movement. Smith, Roszak and Lipton worked especially in metal, which meant that their art could not be produced as fast as paintings, and that limitation of ‘spontanaity’ may be one reason why sculptors are often overlooked in discussions of Abstract Expressionist art. 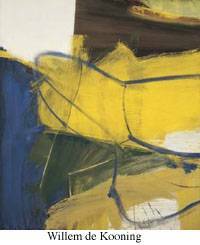 With continuing popularity today, the style of Abstract Expressionism is emotion and energy driven, and explores mediums, lines, shapes, colors, and textures. In addition to the above-mentioned men, some of the notable women in the first wave of Abstract Expressionists include sculptor Louise Bourgeois (1911-2010), and painters Alma Woodsey Thomas (1891-1978), and Lee Krasner (1908-1984). Other important artists of note who painted in this style include: Mark Tobey (1890-1976), Enrico Donati (1909-2008), Adolph Gottlieb (1903-1974), William Baziotes (1912-1963), and Ad Reinhardt (1913-1967). Tobey, however, was isolated psychologically because of his focus on Oriental philosophy. The next wave of ‘second generation’ Abstract Expressionist include Sam Francis (1923-1994), Joan Mitchell (1926-1992), and Helen Frankenthaler (1928-2011). Abstract Expressionism is no longer regarded as cutting edge, having been replaced by a variety of other ‘isms’, but many artists reflecting that style continue to be some of the most recognized in the art market today. Other participating artists remain little known for a variety of reasons, including abandonment of the style, little marketing promotion, racial discrimination and inability to get gallery exhibition space. The artist list accompanying this essay reflects the better and lesser-known early Abstract Expressionists including some who totally turned away from the style.